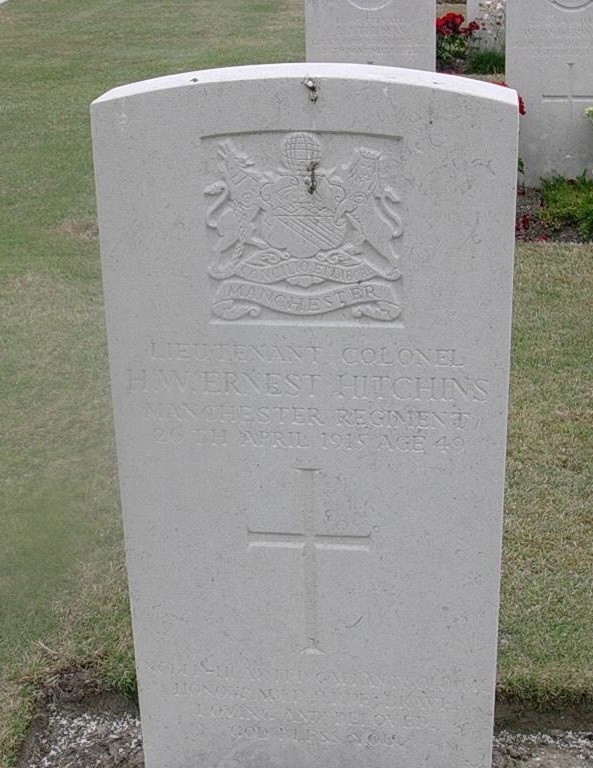 Henry Hitchins was born into a military family and was a career soldier with The Manchester Regiment. He was promoted to lieutenant-colonel a few weeks before he was killed leading his battalion in the Second Battle of Ypres. “The gallant Colonel of the gallant Manchesters” was twice mentioned in despatches for bravery. Henry William Ernest Hitchins was born in Kensington, London on 31 May 1865, the only son of Henry White Hitchins (1822–1890) and his wife Alice Wynn née Tyler (1839–1916). Henry White Hitchins retired from the Royal Engineers in India in May 1869 with the honorary rank of major-general. His father was Benjamin Robertson Hitchins (1790–1867), a lieutenant-general in the Madras Infantry. Henry White Hitchins married Alice Wynn Tyler (the daughter of a member of the Indian civil service from Calcutta) in Kensington in June 1858 and the couple had two children, Alice Christiana (born in India in March 1863) and Henry William Ernest. Henry was baptised at St Wilfrid’s Church at Haywards Heath, Sussex on 17 September 1866. In the 1871 and 1881 censuses, he was living with his parents in the family home of his maternal grandparents at East Lodge, Belmont (off Dyke Road), Hove. At the time of his death, Henry was engaged to his cousin Mary Vivian Holland (born 1877), the daughter of his mother’s younger sister Caroline and Major-General Lumley Hodgson Huskisson Holland (1824–1902), of the Madras Staff Corps. Henry was initiated into Hova Ecclesia Lodge No 1466 on 5 November 1892, passed to the second degree on 3 December, and raised to the degree of a master mason on 31 December. In India, he joined Devon Lodge No 1999 at Jullundur on 14 February 1912 and Lodge Light of the North No 1308 at Dalhousie on 1 June 1912. He remained a member of both lodges until his death. Henry was educated privately before going up to the Royal Military College, Sandhurst from where he was commissioned as 2nd lieutenant to the 1st Battalion of The Manchester Regiment on 25 August 1886. He was promoted to captain on 11 May 1895, and on 17 August 1897, he was appointed as adjutant of the 3rd Volunteer Battalion of the Regiment, which later became the 9th (Territorial Force) Battalion. While serving as adjutant of the depot at Ashton-under-Lyme Barracks, he paid great attention to recruitment, increasing the number of volunteers from 600 to over 1,000. A report in the local press said of him: “As a Regimental Officer, he enlisted the affection and respect of all with whom he had been associated. Officers and privates appreciated his high sense of duty, and loved him for his kindness of disposition and his chivalrous unselfish nature.” At Ashton-under-Lyme, he acted as staff officer to Colonel Howell Gunter (1844–1902), the commanding officer of the 63rd Regimental District, with whom he had a particularly good working relationship. Gunter’s death from a heart attack in August 1902 was reported to have “clearly devastated” Henry. Having been promoted to major on 1 July 1901, Henry remained as adjutant until 14 July 1903. On 1 June 1906, he became second in command of the 1st Battalion, with whom he was sent to India the following month. In December 1911, his battalion attended the Delhi Durbar, to commemorate the coronation in Britain a few months earlier of King George V. In India, he was known as a fine horseman, a keen judge of a good horse and an enthusiastic polo player. When war was declared, Henry was temporarily in command of the 1st Battalion in the absence of the newly-appointed commanding officer, Lieut-Col. Edward Peter Strickland, who was in England. On 4 August 1914, the battalion was stationed at Dalhousie, Amritsar and Jullundur, as part of the Jullundur Brigade, 3rd (Lahore) Division. 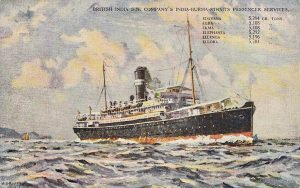 Henry was responsible for mobilising the battalion, and on 29 August 1914 they sailed from Karachi for Europe, on the SS Edavana. 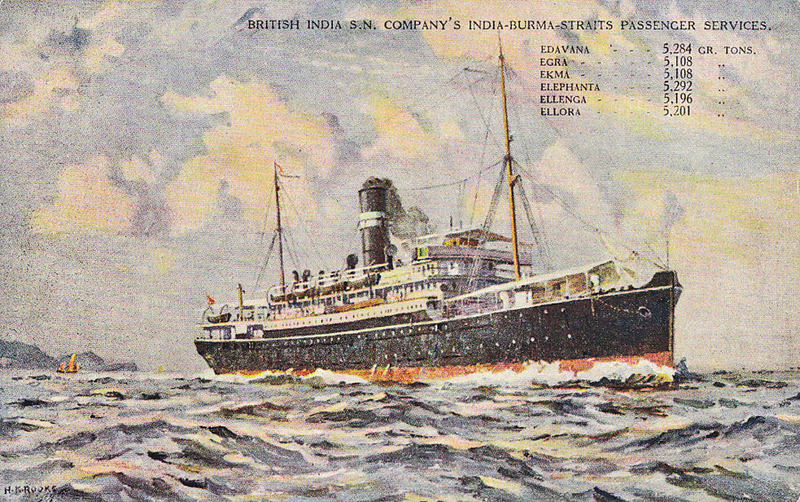 The Edavana was a British India Steam Navigation Company vessel of 5,284 tons built in 1911, which was commandeered as a troop carrier. The departure was delayed by the activities of the German raiders Emden and Konigsberg operating in the Indian Ocean. The brigade reached Suez on 13 September, from where they travelled by train to Cairo and on to Alexandria, where they rejoined the Edavana on 19 September, eventually reaching Marseille a week later. In Marseille, the battalion was re-equipped for the European theatre of operations, including being re-armed with the latest pattern rifle, at Château Borély, to the south of the city. Finally, the battalion were transported northwards by train, reaching Ypres in late October and arriving at Estaires, about 11 km west of Armentieres, on 23 October. On 26 October, the battalion relieved the Bedfordshire Regiment at Festubert, where they first came into contact with the enemy, suffering their first casualties, losing 7 men. On 29 October, they moved north 12 km to Picantin (Laventie), taking over trenches near the Rue Tilleloy, where they remained until 13 November, under constant shellfire. The battalion spent the next month in and out of the trenches until 20 December, when they were ordered to march to the hamlet of Gorre (4 km east of Bethune) from where they launched an attack on the strategic village of Givenchy (now Givenchy-lès-la-Bassée) on the La Bassée Canal. The battalion commenced their attack at 3 pm and were met with fierce resistance from the Germans. Hand to hand fighting took place, and the battalion eventually took the village, which they held all night. The following morning, the battalion repulsed a German counter-attack, but the loss of French troops on their left exposed their flank and they were forced to retire temporarily, before another successful attack, which regained two lines of trenches. The Germans brought up reinforcements and the battalion once again retreated to be replaced by other British troops, by which time the battalion had been engaged in fighting at Givenchy for a continuous 30 hours. During the action at Givenchy, Henry was in command of three out of four double companies. His actions, described as “quite fearless and heedless of himself but…all the time thinking of his men”, for which he was mentioned in despatches. At Givenchy, he was shot though the thigh and was sent to hospital in England, where he arrived on Christmas Eve. On 10 March 1915, he was promoted to lieutenant-colonel and appointed commanding officer of the 1st Battalion, with Lieut-Col. Peter Strickland being promoted to brigadier-general in charge of the Jullundur Brigade. Henry returned to the front on 1 April 1915, by which time the battalion had suffered severe casualties in the unsuccessful attack on Neuve Chapelle. In April, the battalion were ordered to move to the Ypres area, where the German use of chlorine gas had devastated the French defenders and created large gaps in the front line. On Monday 26 April, the battalion were at the small hamlet of Wietje, north-east of Ypres and launched their attack in the direction of the village of St. Julien (now Sint-Juliaan). Despite suffering heavy casualties from machine gun and shell fire, the Manchesters, “as stubborn and superb here as at Givenchy”, pushed on towards their objective and gained a distance of over 1500 metres. In the attack, the 1st Battalion initially reported 16 men killed, 217 wounded and 56 missing, although the CWGC records 38 deaths that day for the battalion. The battalion gained several awards for gallantry, including the Victoria Cross won by Corporal Issy Smith for rescuing several wounded men despite being exposed to heavy gunfire. 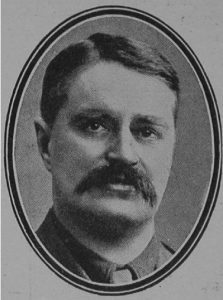 Lieutenant-Colonel Henry William Ernest Hitchins was shot through the heart by a stray bullet whilst crossing the ground between the French and British trenches at 9.30 pm on 26 April 1915. He was carried by his men to a ruined farmhouse, where his death was confirmed. The inscription was paid for by his fiancée. He was again mentioned in despatches “for gallant and distinguished service in the field” for his actions on the day of his death. A military memorial service was held at the regimental depôt at Ashton-under-Lyne, in the presence of members of the regiment, the mayor and representatives of the corporation and other public bodies, at which there were many glowing tributes. He is justly described as “the gallant Colonel of the Gallant Manchesters” who met a soldier’s death whilst commanding with conspicuous bravery the battalion he loved so well, who trusted him so thoroughly, and who followed him so loyally to the death. As well as the Masonic Roll of Honour, he is commemorated on the war memorials at Hove Library and in the Memorial Chapel of the Royal Military Academy at Sandhurst. He was awarded the British War Medal and the British Victory Medal, plus the 1914 Star for service in the front line before 22 November 1914. Henry’s mother, Alice, died at East Lodge, Belmont on 31 July 1916. His fiancée, Mary, married Wilfrid Augustus Roper Smithers (1868–1947) at St George’s, Hanover Square, London in 1922. After their marriage, the couple adopted the surname “Roper Lumley Holland”. Mary died in February 1955, aged 77. 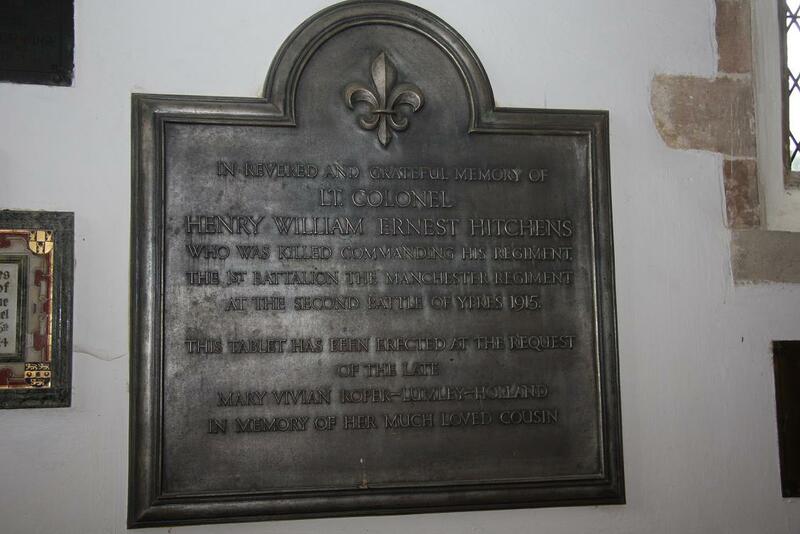 After her death, at her request, a bronze plaque was installed in the church of St Peter & St Paul in her home village of Lynsted, near Faversham in Kent, “in memory of her much loved cousin”.